Spring has arrived and with that, garden work will begin. I love each year working compost into the garden and prepping it for seeds and seedlings. The smell, the feel, the fresh air - love it all. The dogs sit in their fenced in area and supervise me, making sure I stay on task. The chickens help scratch and dig, looking for special treats like worms, and leave their droppings behind for the future plants to enjoy. Here are 10 things to keep in mind for planning or starting your own garden. Use The Buddy System - not for you, for your plants. Particularly if you are limited with space, learn which plants do well together and buddy them up. Think Like A Critter - learn from my mistake and figure out how critters will get to your produce and stop them by adding a fence, netting, moth balls, etc. Stake Your Claim - use branches, cages, etc. to stake the plants that should be staked. Putting them in early helps you not interrupt the root system. Plan For Succession - what plants will you be able to plant in the summer for fall bounty? When you plant your garden, figure this into the plan. Plant What You Eat - sounds obvious but it isn't. If you aren't a huge fan of zucchini, why would you grow more than 2 plants? Try new things, little by little, but use the majority of your space to plant things you know your family will eat. Know Your Type - what type of soil do you have? How should it be amended? Although you can absolutely plant a garden and get a harvest without much soil amendment, if you want large plants and high production taking a bit of time to test your soil will make all the difference. Keep Your Cool - use mulch in your garden to help regulate the soil temp's and help retain moisture. If you use straw, make sure it's mulching straw so you don't end up with weeds. Don't Dry Out - although the mulch will help tremendously, make sure you have a water source for your garden, particularly in the heat of summer. If you have the ability to use soaker hoses this will be more beneficial than overhead watering since water on the leaves can compromise some of your plants. Use Your Trash To Your Advantage - consider making a compost pile or direct composting into the soil. It's a great way to recycle some of your garbage and adds a tremendous amount of nutrients to your soil. Use What You've Got - no need to run out and buy the tools others tell you that you must have or purchasing a bunch of tools because they look cool. Start with a couple of basics and wait to see what you think you'll need to add. 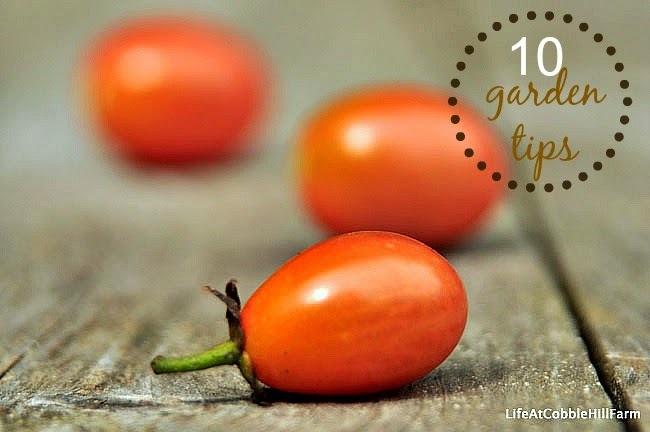 You'll be reaping the benefits from your garden in no time!! Are you getting ready to garden? Sharing at the Maple Hill Hop! Good reminders. Not sure if we will do a garden again this year. We have wrangeled the raspberry vines and have them tied and ready to produce. Not sure about the strawberries. Seems to be fewer this year. Sounds like you are organized and ready to go. Good luck!! Definitely pinning this list! Clear and concise. Thanks for the reminders! We need to dig out our seeds and get as much planted (started inside and out in the garden) as we can this weekend. Cannot wait to have a garden this summer!! !